So, if you take half of a 24-hour allergy tablet, does it work half as well for 24 hours or is it fully functioning for 12? 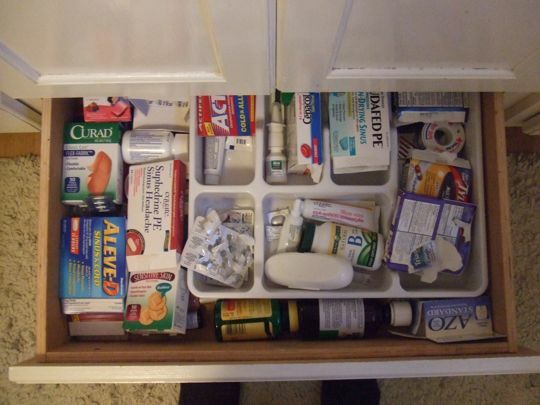 Speaking of medicine, this is our medicine cabinet drawer, located in the upstairs bathroom beneath the under-sink cabinet, which is directly below the ugly pink countertop. It is a wreck inside. An organized person would spend ten minutes going through this and tossing expired medication and sorting the stuff into easy-to-navigate categories. People like me buy three kinds of medication when someone is sick, hoping that one of them will cure the symptoms, then throw the boxes into the abyss. So, how long will my medicine last? Along those lines, do you think that expired medicine has grown weak and ineffective, or stronger than you can possibly imagine? What you need is a good plumbing leak in the sink above the drawer. That would take care of all the old medicine in there. First, that drawer is not messy!! Are you crazy? Second, my guess is the 1/2 dosage would be weak for 24 hours. You’ll have to let us know. Why do you only want to take 1/2 anyway? Third, Zombie Alert green?!? Where’s the scale so I know what green means? I afraid green is not much of a chance…dang it. How many threat levels are there? 24 hour pills dissolve at different rates, thus making them effective for 24 hours. Dividing time release medicines is not recommended. Sorry for the bad news.